Alright, you went for the AR-10 over the ever-popular AR-15. It is a great choice and an excellent rifle to own. Now you need to know what the best AR-10 scope is to complete the package. You need a scope that will provide the best accuracy and is made for longer distances. You will need a scope that provides quick target acquisition in order to get off a faster shot. It goes without saying, but for a rifle like this, you need a scope that is both lightweight and tough. Use this guide to learn a little about the unique qualities and features you would want for the perfect AR-10 scope, then check out our top five picks and see if ones of these fine scopes fit’s the needs you have for your AR-10. The AR-15 is a very popular rifle that is very similar to the AR-10. After all, it was fashioned after that AR-10 as an improved upon model. They are both very lightweight, simple to use and reliable with a very similar body design. The AR-10 is a bit heavier, which is what the AR-15 went on to improve. What’s the weight difference? Mostly the caliber. The AR-15 is bored for a 5.56 or .223 round, whereas the AR-10 is bored for a 7.62 or .308 round. The .308 is a much bigger, heavier round which adds to the total rifle carry weight. This also makes it more powerful. When looking for more stopping power and a little bit longer distance shooting, the AR-10 is definitely the way to go between the two rifles. An AR-10 is better for longer distances than the AR-15, but it is still a tactical rifle and designed to be used in close range as well as longer distance engagements. That said, it would be good to have a scope designed for both scenarios. A true 1x-zero magnification variable might be good to have, or at least a scope with a lower magnification setting for close range targets. For longer distances, with an AR-10 you would probably only want to stick to around 1000-yard maximum range, so you need not go too crazy with the power setting there either. Keep in mind that the best and most efficient power setting for your scope is the lowest possible setting that provides a clear view of the entire target image, not just the target point. Meaning, if you’re hog hunting and aiming dead-center for the chest, you don’t want to be solely focused on the chest, you want to see the whole hog and probably at least some of its surroundings. Situations and conditions can change rapidly, and a clear view of what’s going on and the ability for quick target acquisition can not only be beneficial, it can be life-saving in certain situations. For this rifle, many people opt for a good range finding reticle, such as a BDC or range finding MIL dot. Another great feature that’s pretty popular is an illuminated reticle. 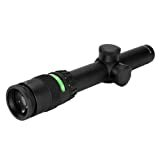 This just increases your aiming point options for not only different shooting scenarios and distances but also different or poor lighting conditions. Another decision you must make for your reticle is which focal plane you prefer, first or second. A first focal plane reticle is one that changes in size with magnification. So you’re not only zooming in and out of your target image but also the reticle. The second focal plane reticle is always fixed to the same size, so with magnification, only your target image zooms in or out. No matter what you’re shooting, if you’re going to have a scope, you want the cleanest, clearest image possible. This means high-quality glass with fully multi-coated lenses. Multi-coated lenses are a series of treatments or coatings that provide protection to your glass for a variety of different conditions, such as fog, waterproofing, glare, scratch resistance, etc. If the lenses are also fully-coating, it means that all glass lenses are coated, not just one or the other. Having fully multi-coated glass lenses makes every lens in the scope as tough and clear as possible, giving you the greatest viewing advantage. Weight can be an important factor in deciding which scope to go with. You want the lightest carry possible, and a scope can be a huge impact on your overall weight. The weight and size of your scope can be affected by how large of a magnification setting it will go to. With larger magnification means more glass layers and treatments, more components to worry about adding to weight. This is one more reason to keep to a magnification power range that’s as low as possible for what shooting application you need. As with any other tactical-style rifle, a nice rugged scope is preferred. Not that you’re going to go beat it up, it’s just nice to have something that you know can handle a little abuse when the going gets rough. This is why a tough constructed body design, solid tactical turrets, waterproof, fog proof, and anti-shock treatments are all features that you would want for your scope. Eye relief is the distance that your eye must be to the ocular lens to get the full, clear view of your target. A wider eye relief gives you a little more wiggle room. Better eye relief generally depends on the magnification setting and the lenses. For example, obviously, the larger or wider the objective lens, the larger your view will be. But the larger your magnification, the less light gets transmitted to your eye. This makes the circle view smaller even though your image zooms in, thus restricting your eye relief. Then you would have to position your eye closer to the lens. Just remember to look for that larger eye relief. Usually, about three inches is great, and gives you some space to protect your face from recoil. Related Read: How to mount a scope on the AR. The Tract Response 4-16×42 is a beautifully constructed long rang scope designed specifically for the AR-10 platform. The reticle on this scope is an extremely versatile glass-etched BDC that’s good out to 800-yards measured out in 50-yard increments. It also features 10 mph windage correction dots which is really convenient while hunting in crosswinds. The Tract Response sports a large 42mm objective lens and fully multi-coated optics, making for a great low-light AR scope. The exposed, tactical hand turn windage and elevation turrets are precise and repeatable with audible ¼ inch clicks at 100-yards and are easily re-settable. Other awesome features of this scope are the unique Pointed Post Bracketing System which allows you to precisely place the reticle, especially when needing to hold slightly higher or lower on target, and an impact program that allows you to accurately calculate your bullet drop. Along with all this is the Tract lifetime warranty, which has no time limitations, no paperwork needed and applies for the lifetime of the scope, regardless if you are the original owner or not. Customers of this scope seem to love everything about it. From the construction quality to the advanced BCD reticle and easy to use, hand adjustable windage and elevation turrets. Nobody seems to have anything negative to report about this scope. The Trijicon TR24 is a great scope for shorter distance target shooting. The reticle is dual illuminated with both fiber optics and tritium, therefore no need for batteries, making then overall scope lighter-weight than it would otherwise be if it were not independently illuminated, and also less likely to malfunction due to battery failure. Fiber optics keep illumination as long as there’s any ambient light, while the tritium will glow even in complete darkness. Win-win. The rugged body of the scope is crafted out of aircraft-grade, hard anodized aluminum, which helps protect it in the harshest elements. The multi-layer coated lenses provide for superior clarity and light transmission with zero distortion. It also features a multi-focus eyepiece ensuring unsurpassed edge-to-edge optical clarity. Other features of the Trijicon TR24 are the nice long eye relief and the manual brightness override. Customers love this scope. There’s not much else to say. It’s super tough and physically won’t break. Not without effort anyway. There’s no batteries to worry about running out or wearing out, and it functions every bit as well at short distances as any red-dot sight, with the benefit of turning a knob and achieving out to 300-yard distances. It’s high-quality constructed and lightweight. Most customers just don’t have enough good things to say. There are not really any negatives to note. One customer reported that the illuminated cross-hair could have been brighter. Related Read: Trijicon also makes great ACOG Scopes. The Vortex Optics Strike Eagle is a true 1x powered variable scope for quick target acquisition in close quarter scenarios, that adjusts up to 6x power for longer distances. The fully multi-coated lenses are high-quality and provide a clear, crisp sight picture and optimal low-light performance. The reticle is an illuminated, glass-etched BCD reticle with 11 different illumination settings to accommodate for changing light conditions. An extra battery for the illumination functions can be easily stored in the windage cap. Making sure your reticle is always sharp and focused is a convenient, fast-focus dial on the eyepiece. On top of all this, this scope is waterproof, fog proof and shockproof, to be a reliable asset in all weather conditions. 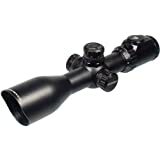 Customers of this scope love the high-quality, rugged design and the crisp, clear glass. The optics are precise and work great for multiple yardage targets. Most customers have expressed that you won’t find a better quality of performing scope unless you plan to pay three to four times the price. Negatively, several customers have reported a bad fish-eye effect at 1x power until the target is about 20-yards away. Also, many people seem to be disappointed by the reticle and that often times the illumination wears out. Nikon consistently produces top of the line optics for almost anything you can shoot, and this scope is no different. The Nikon P-223 BDC 600 sports a BDC reticle with open circle aiming points and hash marks from 100 to 600 yards. This make for an effective longer range shot as it gives you options between two different bullet drop compensation methods. Coupled with Nikon’s Spot On Ballistic Match Technology, this reticle is sure to be a desirable asset in the field. The Nikon P-223 is constructed of a polymer and aluminum body and features fully multi-coated optics for maximum brightness and light transmission. Spring-loaded instant zero-reset turrets make for quick and easy adjustments. These rapid action type turrets are tactical-style and hand adjustable for ¼ inch at 100-yard adjustments. Customers of this scope are mostly very pleased with it’s performance. They love the BDC reticle and the Spot On programming that allows for such accurate shooting. Another aspect people praise is the very easy install with most people doing it themselves and still being able to shoot dead-on. Some have mentioned that off-set rings are needed as the scope sits forward to allow for proper eye relief. Some negative customer comments include fuzziness or blurriness and difficult target acquisition. Also, it seems a pretty consistent problem that the turret knobs come defective or else fail within a short time period. The UTG 3-12×44 is a compact, durable 30mm scope, build on a True Strength platform. The body is completely sealed and nitrogen filled to be shockproof, fog proof and rain proof. The lenses are best in class multi emerald coated for maximum light transmission and extreme clarity. The scope also has an integrated angled front sun shade with flip-open lens caps. The UTG features a special circuit and housing design for uninterrupted illumination even under heavy recoil. The consistent and precise adjusting target turrets are a premium zero locking and zero resetting type. Truly unique to the UTG scope is the tactical, range estimating, mil-dot, full 36-color EZ Tap Illumination Enhancing reticle. The reticle colors are traditional red or green, with this 36-color multi-mode operation, which is not only great for different environmental and lighting changes but also if you’re color blind. This range estimating reticle also is unique in that it has more aiming points than a traditional mil-dot reticle. Added to all this awesomeness is a lifetime warranty! Customers of this scope seem to really like the functionality of the parallax focus knob and say it really is beneficial with this scope. They also say that it is very tough and the glass quality is pretty good, though it could be better. Adversely, people have complained that this scope it blurry, heavy and the illumination reflects really bad from the inside. Others complain that the 36-colors, though kind of a neat idea are really quite a pain. Apparently if you pass up the color you’re looking to set it to, then you have to continue through all the other colors until you come back around to the right one again. Plus, they say that the colors are random and not in any particular order. Would I be better off with a longer or shorter range scope for my AR-10? – Either, it depends on what and how you will be shooting with it. The AR-10 is more powerful and better for longer distances than the AR-15 but is used in either application. You now have a pretty good idea on what to look for and some of your options out there. Hopefully, this guide on our top five best AR-10 scopes has been just what you need to aid in your choice. Happy shooting! If you enjoyed this article check out our other one on scopes for the 300 blackout or sights for the AR Pistol.